Do you want some relax sounds? Enrich your device with relaxing music! Download Relaxing Sounds now! If you have any unwanted stress in your life, take a deep breath and relax yourself, we have some self-help audios in the form of relax ringtones. You can play them at home, at the office, while resting or studying. Set relaxing tunes as your ringtone. If you want a good drug-free alternative, relax melodies will help you. Meditation sounds are perfect for home listening as relaxing sounds. If you prefer subtle instruments that create peaceful state of mind, these ringtones unlimited are the right choice. If you need something to fill in the silence, best ringtones free come in the form of ringtones and sounds. Relaxing music has the special charm to affect somebody`s mood, relaxing tunes are at your disposal. Regain control over the decision about at which time you`ll go to sleep with relax melodies. If you are suffering from insomnia, consider trying out sleep music and relax sounds. Relaxing sounds will bring so wanted relaxation to your body and soul. Help is at your fingertips in the form of relaxing ambience music. 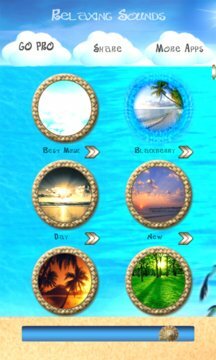 Relax ringtones are carefully chosen to help you drift off into a deep state of bliss each time you play relaxing tunes. It`s sleep time, so relax yourself with a new way of relaxation, best ringtones free. This app has been tested on the following Windows devices : HTC 8S, HTC 8XT, Huawei Ascend W1, Huawei Ascend W2, Nokia Lumia 520, Nokia Lumia 521, Nokia Lumia 525, Nokia Lumia 620, Nokia Lumia 625, Nokia Lumia 720, Nokia Lumia 810, Nokia Lumia 820, Nokia Lumia 822, Samsung ATIV Odyssey, HTC 8X, Nokia Lumia 920, Nokia Lumia 925, Nokia Lumia 928, Nokia Lumia 1020, Nokia Lumia 1320, Samsung ATIV S, Samsung ATIV S Neo, Nokia Lumia Icon, Nokia Lumia 1520, Samsung ATIV SE.